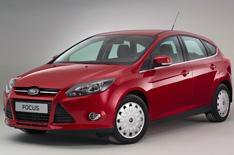 New 99g/km petrol engine for Ford Focus | What Car? The new Ford Focus Ecoboost is set to be the first petrol family car to achieve under 100g/km of CO2. The 1.0-litre Ecoboost engine will produce 99g/km of CO2, is capable of a claimed 67.5mpg and will be exempt from Vehicle Excise Duty. The Ecoboost engine produces 99bhp and 47% less CO2 than a 1.6 Focus from less than 10 years ago. In order to achieve these figures Ford has added a stop-start system, low rolling resistance tyres and improved the Focus's aerodynamics. Estimated starting prices are around 17,000. This will extend to three the number of Focus models offered with the 1.0-litre Ecoboost engine, along with the 100 and 125 versions. The engine will also be available in other models in the Ford range, such as the Ecosport SUV, Transit Connect, Transit Courier, Tourneo Connect and the all-new Mondeo.